Fortunately, Mountain Lakes Preserve has not been invaded by Bermese pythons (check out NOVA this coming Tuesday on PBS), despite the appearance of this poison ivy vine. 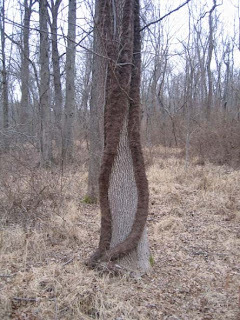 It looks like it grew a winter coat, but poison ivy vines are always hairy, which rhymes with scary. 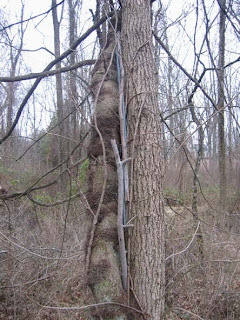 In this photo, the poison ivy is almost as big as the tree its climbing on. Looks like an angler stashed some fishing line inbetween the two. 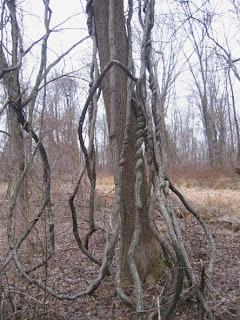 Further up, it looks like the tree has lots of branches, but these are actually the vine's lateral shoots, which will bear flowers and berries later on. What we have here is essentially a poison ivy tree held upright with the help of a "donated" trunk. 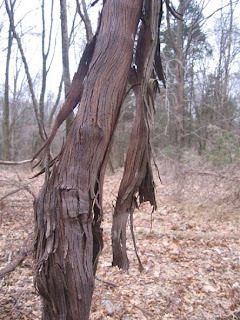 The vine with the shaggy Irish setter-like bark is wild grape. 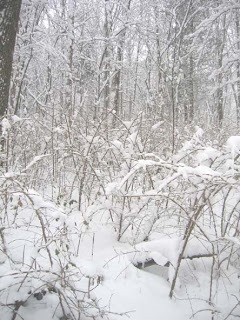 Native vines like poison ivy and wild grape tend not to grow in a way that would strangle the trees that support them. Japanese honeysuckle, on the other hand, was spiraling up this shrub in a way that would eventually choke it. 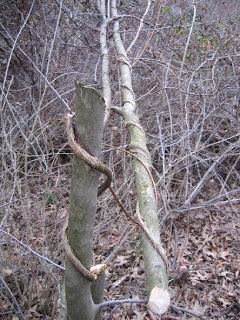 The trunk of the shrub was already getting distorted by the vine's tight grip. 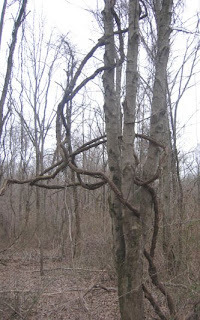 Note exotic honeysuckle vine's stringy bark, lighter in color than wild grape. Turned out that the shrub was an exotic Asian photinia, so we cut both the shrub and the vine. Asian bittersweet is very common at Mountain Lakes, identified in winter by its gray bark and large size. I had hoped to learn to distinguish it from native bittersweet before starting large scale removal, but it's likely that no native bittersweet remains in the park, or has lost any clear identity through hybridization with the exotic species. It's usually very difficult to photograph a woods so that you can see individual plants clearly. The result tends to be a green blob, whether the woods is degraded or healthy. Snow can change all that. Look in the middle of this photo, and you can see how snow highlights and makes visible hundreds of invasive winged euonymus shrubs that have sprouted from seed on a slope between Mountain Lakes and Coventry Farm. 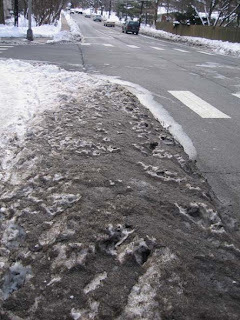 Meanwhile, the blackened snow lining city streets helps reveal what in other seasons is rarely noticed: all the soot and crud left behind by auto exhaust, oil drippings, and the gradual wearing down of tires and brake linings. All of this gets swept into the local creek, which in this photo is Harry's Brook, flowing under the road where it dips down in the distance. 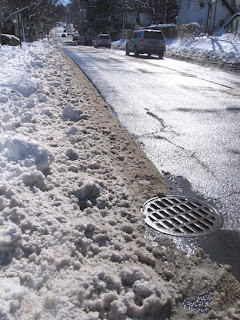 Given enough time, the snow will turn completely black with soot. This crud is what we are feeding to all the aquatic life in the local streams. 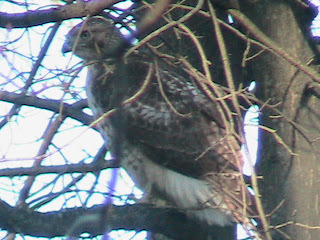 One day a few weeks back I heard a great beating of wings in the backyard. Could it be the hawk I'd seen coming through now and then, which a birder friend told me might be an immature redtail looking for a nice feathery snack for lunch? ..... of documentaries at the recent Princeton Environmental Film Festival that told of vast gyres of plastic trash collecting far out in the ocean. The plastic absorbs pollution from the water, then gets inadvertently swallowed by fish or whales, whose stomachs slowly fill with toxic, indigestible plastic. ..... or the time a decade back when I visited the far south of Argentina's Patagonia. There, the summer wind blows so strong it can yank a plastic bag out of your hand and send it sailing down the street, to catch on distant fencelines or any plant brave enough to grow more than a few inches high. Some fields of desert scrub, downwind of town, fooled me, too, appearing at first glance to be in full bloom, decked out in the white of fugitive plastic. 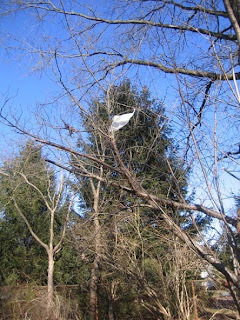 From its perch high in a backyard tree, that's what a deceptive bag is saying to all who will listen: "Don't be fooled. Little things add up." 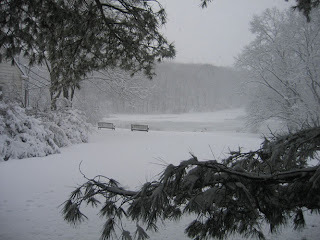 Even before the snowstorms hit last week, this winter has been marked by a flurry of activity at Mountain Lakes, with a blizzard to follow, come summer. 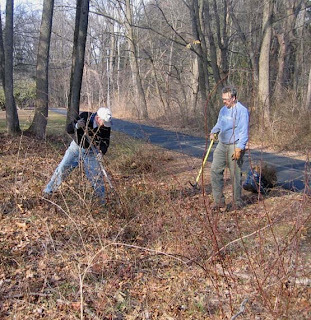 Here, two FOPOS board members, Clark Lennon and Tim Patrick-Miller, are removing invasive shrubs from an area near the Mountain Lakes House, as part of a beautification of the grounds that's starting to gain some momentum. A couple hundred yards southeast of the house, visitors to Mountain Lakes may have noticed some pink ribbons showing up in one area of the woods. The trees have been numbered, measured and mapped so that a location can be chosen for a clearing, to be used as a staging area for the dam restoration and lake dredging work scheduled to begin in July. Much discussion has gone in to selecting an area that will disturb as few of the marked trees as possible. Township engineers have been working closely with FOPOS (Friends of Princeton Open Space), which holds the conservation easement on the property and has to approve various aspects of the proposed work. For those interested, the township will present its plans for the dam restoration and dredging project, and accept public comment, on March 1st at 7pm in the Main Meeting Room of the Township Municipal Building. 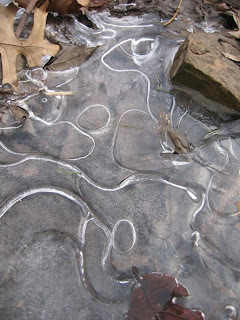 A backyard minipond serves as a canvas for nature's artwork in the winter. Embedded in the beauty is many a physics lesson: the rock that melts the ice above, the leaf that melts the ice below, the bubbles trapped beneath and within, and the forces at work in forming all those loops and squiggles. The impulses of kids to walk on ice or try to break it are safely explored on a shallow minipond like this. We were surprised to discover that beneath the ice was not water but air. 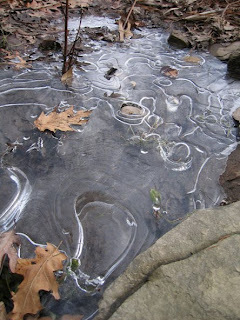 After the ice forms, the water beneath continues to be absorbed into the underlying soil, leaving a gap. Some people might look at this December scene and see a drainage problem. 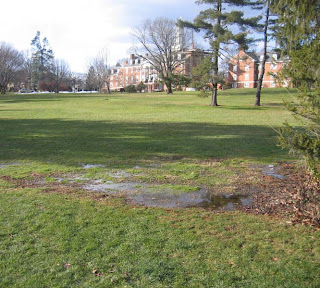 I see a spot begging to become a wetland garden, so that some small portion of stately but static grounds can be devoted to habitat and color. Question: How could the wind fashion snow to look like a cross-hatching of shingles? Answer: Until a better one comes along, Bob Dylan's answer will have to do. 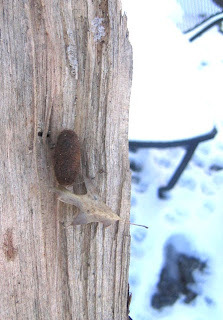 or biding over the next generation of moths until spring. 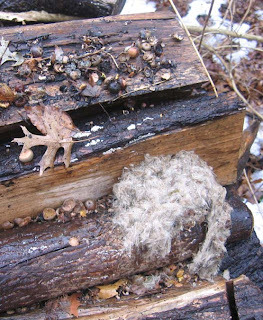 The mice may well have provided food for the screech owls that nested in one of our trees last year. 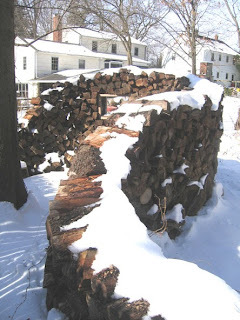 In the future, I'm thinking of making enough woodpiles that some may stay through the winter, as compact habitat serving the varied needs of varied critters. 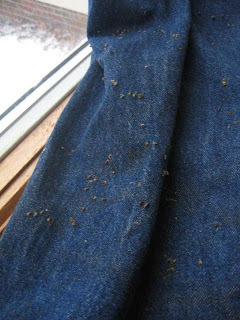 This was one of my sharings at a December meeting of Procrastinators Anonymous--workpants so intimidatingly covered with stickseed burs that they remained in a heap in the basement for four months. My mind of big ideas resisted this nit pick picking project until winter slowed me down. Stickseed (Hackelia virginiana) is deceptive in multiple ways. In the borage family, it starts out in the summer looking like a classy plant with ornamental possibilities. But its flowers turn out to be tiny, and instead of reaching some point of mature beauty, it fades into the background and sets a trap. The leaves dry up, leaving only a delicate frame that holds aloft hundreds of burrs through fall and winter. I've learned to keep an eye out for this plant, lest I become yet again an unwitting disseminator of its seeds. 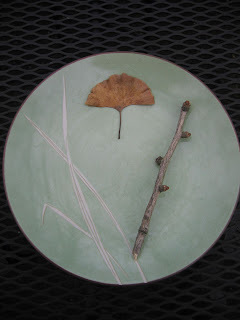 Ginkgo biloba--leaf and twig with "short shoots". 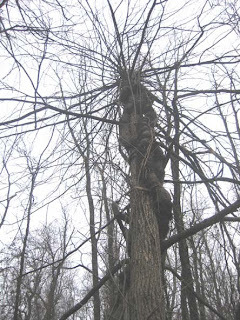 A very informative article describes three tree species that are living fossils, a term used for species that are found both alive and in the fossil record, and have few living relatives. Along with the ginkgo, the article mentions sweetgum and dawn redwood. All three can be found growing in Princeton. Sweetgum is native to North America, the others to Asia.